It works without chemicals.  Friendly to environment. The finest fiber (10,000 times thinner than hair, and finer than micro fiber cloth) of Comfoam dirt erasing sponge-cloth penetrates surface grooves to remove all kinds of the dirt with only water! You can use Comfoam all over the house from the set-in dirt in the kitchen,  tea stains and oven grease, to the bathroom,  soap scum and lime scale. 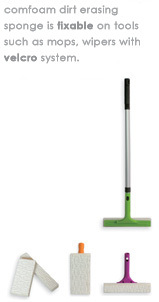 Comfoam is made from melamine foam, and surpasses melamine sponge in durability and practicality. Melamine sponge is very effective but needs to be replaced regularly. 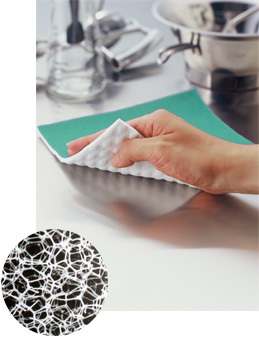 Comfoam is as effective as Melamine sponge but it lasts longer and is easier to use. Laminating with fleece cloth makes Comfoam easy to use and hard wearing. Comfoam can be machine-washed and used repeatedly. Comfoam  compressed melamine sponge-cloth is under the registration as a new design for practical use. Comfoam Germany GmbH is officially licensed from BASF ® for purchases of Basotect ®. You can request the size of Comfoam dirt erasing sponge-cloth and Melamine sponge as you wish when you order the products.